Thanks to the Federal Reserve, high quality preferred stocks are now generating about 42% more income than the highest rated corporate bonds, preferred stocks that, in many cases, are issued by the same companies as those bonds. In a March 2 article Michael Gross, leader of PIMCO, the world's largest bond fund, makes the case that the Federal Reserve's Quantitative Easing program ("QE2") is putting significant downward pressure on treasury bond yields, just as the program was intended to do. Gross goes on to point out that when the QE2 program comes to an end, now scheduled for June, investors should look for treasury yields to head up, the stops having been removed. The idea behind QE2 is that by the Fed purchasing $600 billion in treasury bonds from its member banks, these securities are removed from the bond market, substantially reducing supply. Investors looking to make bond purchases will therefore have to pay more than they would have otherwise. Because investors have more of their money invested per share, the return on their investment (the yield) goes down accordingly. Lower treasury bond yields make it cheaper for companies to issue corporate bonds since the rates of the two relate directly to each other in the marketplace. Ironically, the yields on 5- and 10-year treasuries have done nothing but increase since the Fed announced QE2 last November. This unexpected result is explained by Fed officials saying that, even though yields have increased rather than decreased, the amount of the increase has been substantially dampened by the Fed program which is, therefore, a roaring success. In addition to the yields of corporate bonds being lower than they would have been otherwise, the Fed's policy of cheap money has also pushed down the interest rates being offered by bank Certificates of Deposit (CDs). A near-zero federal funds rate has allowed member banks to generate small but no-risk profits by borrowing at zero from the Fed and using the proceeds to buy treasury bonds, providing some much welcomed relief for banks still dealing with high loan delinquencies, mortgage foreclosures and commercial real estate vacancies. So the policy has been helpful for banks, now cash-flush and more profitable. But for savers (bank CD investors), the policy has been brutal. 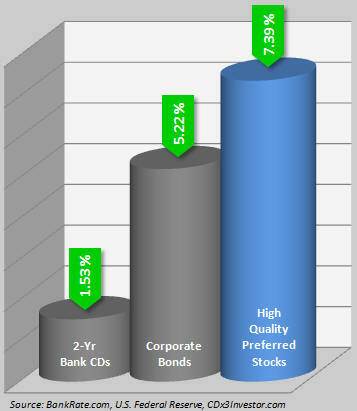 Figure 1 shows the yields being offered by 2-year bank CDs (average of top 10 U.S. yields, source: BankRate.com) and investment grade corporate bonds. By holding the federal funds rate at near-zero, and by using QE2 to put downward pressure on treasury bond yields as well, individual investors planning on a return on their nest egg north of 5 percent have been decimated. Bank CDs are paying less than 2 percent while investment grade corporate bonds are around 5 percent. And that's before you subtract out income taxes and inflation. Now look at the yield currently being produced by high quality preferred stocks. A dollar invested in these high quality preferred stocks would earn 7.39 cents while that same dollar invested in investment grade corporate bonds would leave you with 5.22 cents a year later. That's a 42 percent improvement in your income. Figure 2 lists 45 of the highest quality preferred stocks available on U.S. stock exchanges. These preferred stocks are issued by 19 different companies in 11 industry segments. This same list, with trading symbols, was presented to CDx3 Notification Service subscribers in the March issue of the subscriber's newsletter, CDx3 Research Notes (note that the trading symbols are obscured here in order to protect the values of subscriptions to the CDx3 Notification Service, my preferred stock email alert and research newsletter service. Subscribe for symbols). Notice that all 45 of the high quality preferred stocks listed in Figure 2 were available for a market price less than $25.00 on Friday, February 25 when this table was created. The top fifteen have yet to reach their call dates while the remaining 30 have exceeded their respective call dates. 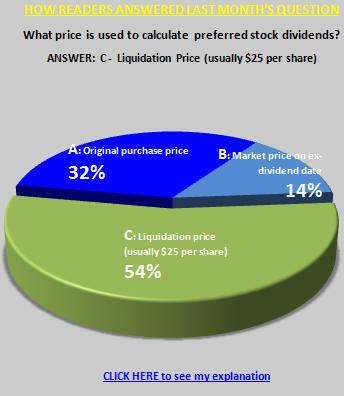 Purchasing your shares for a price less than $25.00 is important since, if the issuing company retires ("calls") the security, shareholders will receive $25.00 per share (the "liquidation price"). So investors who purchase their shares for less than $25.00 receive two additional benefits: (1) an additional layer of principal protection and (2) an opportunity for a capital gain in the event that the shares are retired downstream. Have the "cumulative" dividend obligation in their prospectus, meaning that in the unlikely event that the issuing company misses a dividend payment to you they still owe you the money downstream. If your nest egg needs to be producing an annual return north of 5 percent the Fed's low yield policy, while helpful for banks and companies needing to issue cheap bonds, is not designed to benefit savers. The next best alternative: the highest quality preferred stocks that are selling for less than $25.00 per share. (Already a subscriber? For symbols see page 2 of the March 2011 issue of the subscriber's newsletter, CDx3 Research Notes). Formerly known as HealthCare Properties, HCP is a $13 billion company founded in 1985 and headquartered in Long Beach, California. HCP is the country's sixth largest Real Estate Investment Trust. HCP develops and operates 573 healthcare related facilities throughout the United States including senior housing, life science, medical office, hospital and skilled nursing facilities. HCP's return to investors has consistently exceeded that from most other REITs and the S&P500. This first chart from HCP's 2010 Annual Report illustrates the results of investing $100 on January 1, 2006. The chart assumes reinvestment of dividends before income taxes. The Equity REIT Index is provided by the National Association of Real Estate Investment Trusts, Inc. HCP has a history of strong financial performance and growth through acquisition. "It will be THIS decade when we will finally realize the long-anticipated spike in demand for healthcare properties as aging baby boomers move into their Golden Years. A decade ago, we were essentially chasing the trend — today, we are positioned to catch the benefits of this demographic certainty. This has been made possible by the strategic portfolio repositioning that was completed during the latter half of the last decade." U.S. Census Bureau estimates show that the percentage of our population in the 75-84 age group will climb from today's 8% to about 45% by 2050. According to CMS, on a per capita basis, the 75-year and older segment of the population spends 76% more on healthcare than the 65 to 74-year-old segment and over 200% more than the population average. With healthcare expected to be 17.7% of the U.S. GDP in 2010 (Source: Centers for Medicare and Medicaid Services (CMS), based on the National Health Expenditures report released in January 2009), you can see why Flaherty remarked in March 2009 that HCP is "...the leading real estate investment trust in the largest industry in the largest economy in the world." Learn more about HCP: Company website | Profile | Upgrades/Downgrades | Recent News. The Rule of Buyer/Seller Behavior (Preferred Stock Investing, page 43) tells us that the market price of a preferred stock will tend to increase, beyond where it would have otherwise, as the dividend pay date (the ex-dividend date) approaches. In a theoretical perfect market, this increase would be for the exact amount of the upcoming dividend payment. In the case of our 8 percent preferred stock example, if the market price drops by, say, $0.20 following the ex-dividend date (rather than the expected $0.50), there is very strong demand in the marketplace for this preferred stock. During February 2011, there was very strong demand for high quality preferred stocks. Issues that pay an average of $0.45 per share saw a market price drop of only $0.31 as they cleared their ex-dividend dates. The turmoil in the Middle East has created an opportunity for preferred stock buyers, especially with respect to the specific six high quality preferred stocks shown in this table. The ex-dividend dates of these six preferred stocks are coming up this month too. If you are going to make a purchase, be sure that you do so before the indicated dates. Why these six? Savvy preferred stock investors can often take advantage of the misinformed selling activities of overly sensitive common stock investors. Common stock investors, focused on a company's future profitability expectations, will frequently sell their positions if there is a hint of a down-tick. Many times in such circumstances, common stock investors will sell both common and preferred stock positions, forgetting that preferred stock dividends are more closely tied to a company's cash flow than to this quarter's profits. This type of short-term thinking by common stock investors can create buying opportunities for longer-term preferred stock investors as prices of a company's preferred stocks temporarily dip below $25 and into buying territory. And nothing sends common stock investors to the exits faster than a highly visible and well publicized geopolitical boil-over. Enter Libyan leader Muammar Gaddafi. The turmoil in the Middle East puts six specific high quality preferred stocks, issued by two different companies, directly in the crosshairs for preferred stock buyers. The reason, of course, is the effect that these latest Middle East events have on oil prices. Increasing oil prices eventually affect the price of all things that need to be transported, which is pretty much everything. But long before that happens there is a more immediate affect felt by companies related to transportation. And, even more specifically, such companies that are among the issuers of the highest quality preferred stocks. It is these companies that we are interested in. There are two companies that issue preferred stocks that are (1) rated investment grade by Moody's and (2) have the 'cumulative' dividend requirement (meaning that in the unlikely event that the company misses a dividend payment they still owe you the money). And both of these companies have a perfect track record of never having missed a preferred stock dividend payment. The table you see here was generated using the Preferred Stock ListTM software application provided to those subscribing to the CDx3 Notification Service, my preferred stock email alert and research newsletter service (note that in order to protect the value of subscriptions the trading symbols have been obscured here). These are the six U.S.-traded preferred stocks that are not only among the highest quality issues available, but are also very likely to be available to buyers for bargain prices due to the turmoil in the Middle East. Page 5 of the March 2011 issue of the subscriber's newsletter, CDx3 Research Notes, identifies these two companies. 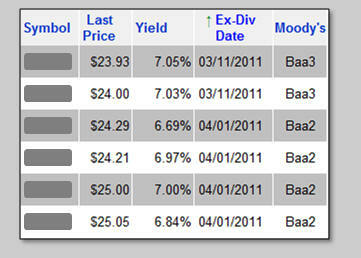 For an added bonus: this table is sorted by ex-dividend date. Remember, whomever owns the shares of a preferred stock on the morning of its quarterly ex-dividend date when the market opens will receive the upcoming quarterly dividend cash from the issuing company. That means that even if you only own your shares for a few days you will receive 90 days of dividend income. Take note of the ex-dividend dates of these six high quality preferred stocks and be sure that if you are going to make a purchase that you do so before the date indicated here.